Space Invaders (Acornsoft, 1982) gameplay screenshot, showing a colourful MODE 7 graphics display. 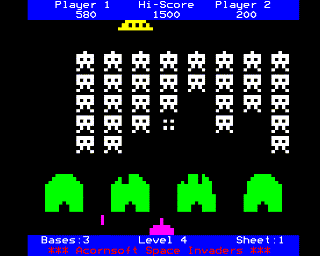 current 20:38, 8 March 2015 320 × 256 (4 KB) WikiSysop (Talk | contribs) ''Space Invaders'' (Acornsoft, 1982) gameplay screenshot, showing a colourful MODE 7 graphics display. This page was last modified on 8 March 2015, at 20:38. This page has been accessed 279 times.